Our buttercream layer cakes are perfect for any occasion! Our round cakes are made up of three deliciously moist layers and filled with fluffy whipped buttercream, ganaches and jams. 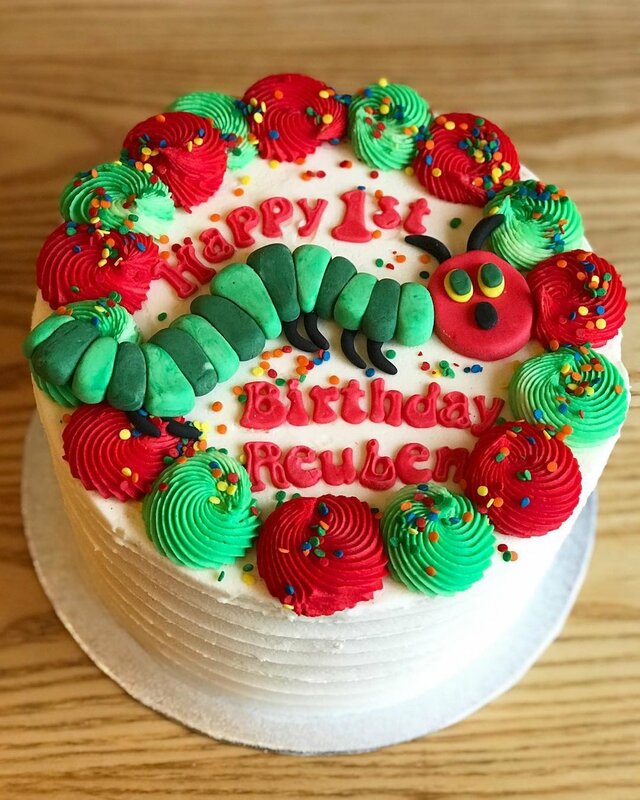 If you aren't sure what to go for we always recommend Red Velvet which is our best seller, along with the Rainbow cake which is a wonderful showstopper. We also take flavour requests so if there's a flavour you want and don't see, email us! Our cupcake flavours are also all available in cake form! 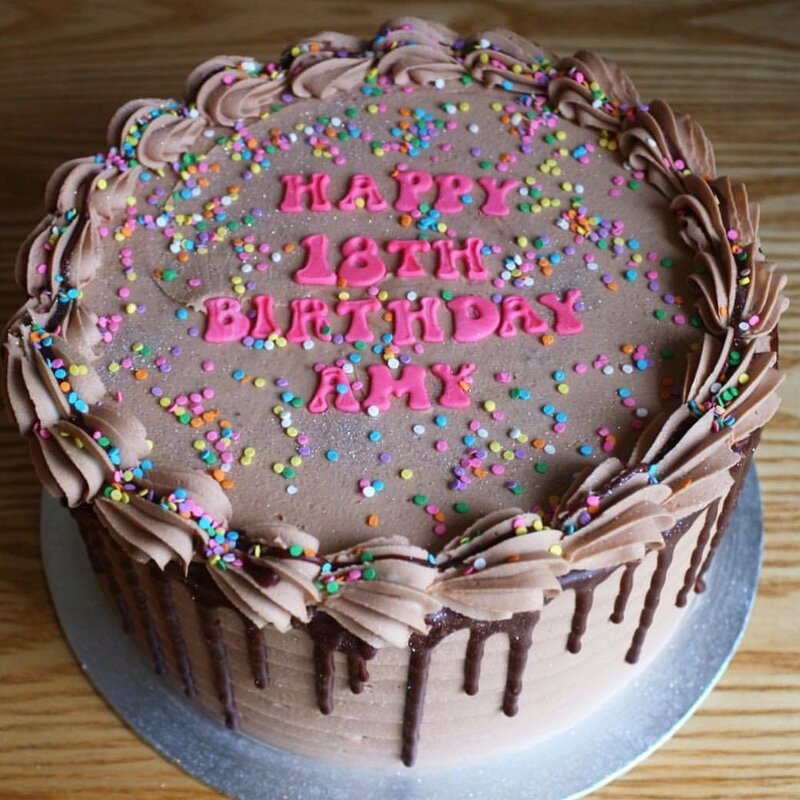 All cakes include a personalised message of your choosing, customisation is also available. You can view a large gallery of our cake photos here. We do provide tiered celebration cakes which make a wonderful showpiece, please contact us for a quote. Based on triangular cake slices. Cakes will yield more servings if providing finger slices. Please contact us for cutting guides or advice. Six layers of delicious vanilla cake in all the colours of the rainbow. One of our top selling cakes! Our best selling flavour, red velvet is a moist light chocolate cake paired with a smooth and delicious cream cheese buttercream. Our personal favourite! A beautifully moist chocolate cake filled with fluffy whipped buttercream made with melted smooth dark chocolate. Our rainbow cake with a magical twist! Adorned with a sparkly unicorn horn, cute little ears and a rainbow mane, the internet famous unicorn cake a huge hit with children and adults alike! Chocolate sponge layed with silky smooth Nutella buttercream, drizzled with lashings of melted nutella and finished with a Nutella chocolate ganache drip. A classic light and fluffy vanilla cake, filled with layers of vanilla bean buttercream and strawberry jam. Made with Madagascan vanilla beans for a delicious depth of flavour. Another of our favourites, we make our carrot cake with chopped walnuts, orange zest and plenty of cinnamon! Finished with our cream cheese buttercream. Zingy lemon sponge filled with tart lemon curd and fresh squeezed lemon juice buttercream. Fresh raspberry or blueberry addition available for a small supplement. Chocolate sponge filled with Oreo buttercream, decorated with a chocolate ganache drip, then finished with even more Oreos! Light as air, our naked Victoria sponge cake is filled with thick layers of fresh whipped cream, and strawberry or raspberry jam and dressed with seasonal berries. Please note this cake must be refrigerated and is not suitable for sitting out for a long period of time due to the fresh cream filling. A Lily Pink Bakery original flavour! Cinnamon cake baked with fresh blueberries, filled with fresh blueberry coulis, crushed digestive biscuits and cream cheese frosting. Our classic chocolate sponge filled with silky salted caramel buttercream and lashings of homemade salted caramel sauce. Chocolate sponge filled with layers of fluffy whipped peanut butter buttercream, decorated with a chocolate ganache drip, salted pretzels, Reece's Pieces and Reece's peanut butter cups. Deliciously moist cinnamon, banana and pineapple cake with chopped pecans, filled with cream cheese buttercream. Please note that our cakes contain eggs, dairy and gluten. Some of our cakes contain nuts but even those that do not have nuts in the description may contain nut traces. Please contact us with any questions regarding allergies or ingredients.